Developed from ground-up with the focus of service providers. 100% redundancy in a single cluster and geo-redundancy between clusters. Unlimited scalability provided by proprietary system architecture. Load Balancer distributes traffic between Signalling Servers. Active/Hot Standby functionality provides 100% redundancy without any session loss. Full SIP signaling and RTP with built-in firewall. All Signaling and Media servers work in Active/Active mode for redundancy. Sends call-by-call routing decisions to Linxa Signalling servers or any existing soft-switch using SIP 302 Multi-Contact Redirect. Proprietary load balancer technology allows significant call processing power There is no limit to call capacity due to unlimited scalability and distribution functionality. Linxa Switch can instantly implement all types of complex routing scenarios such as A number based routing, number portability, time of day/day of week based routing, tiered bilateral deals, LCR and more without any requirement for additional systems. 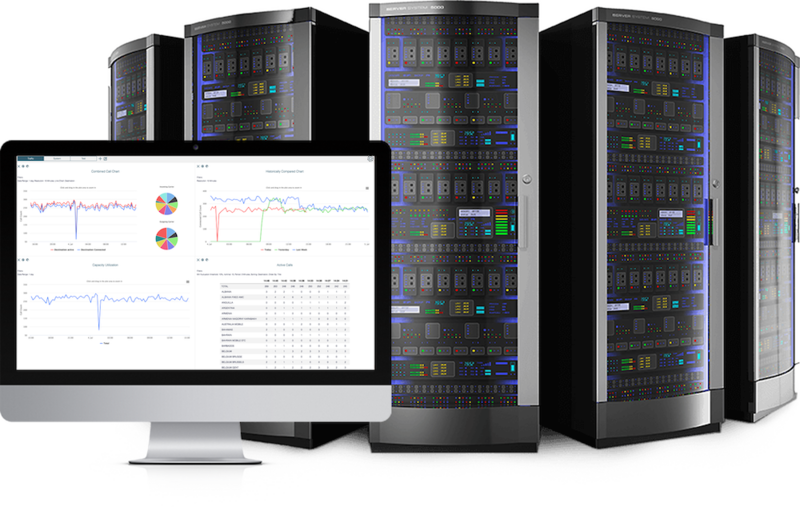 Linxa Switch allows real-time monitoring of the switching platform with detailed statistics such as live concurrent calls, switch capacity utilization and other statistics datas. Proprietary load balancer technology allowing significant call processing power. Unlimited scalability provided by proprietary system architecture allowing the addition of new ports on the fly without downtime. Built-in firewall automatically provisions in real-time using media IP & port data in SIP messages. On the signalling-side firewall is automatically provisioned based on trunk data. Linxa Switch has been in use since 2005 by multiple carriers in North America and processing about 50 billion minutes annually. Hardware independent and can work on any traditional server without a proprietary hardware requirement. Linxa Switch is 100% redundant in a single cluster. For disaster scenarios, geo-redundancy is also available with Active/Active geo-redundant clusters. Linxa Switch allows real-time monitoring of the switching platform with detailed statistics on live calls and switch capacity. Linxa Switch can work alongside existing TDM and VoIP switching platforms to allow seamless transition to a new network architecture. Ability to handle unlimited Call Attempts Per Second (CAPS) due to scalable architecture. Active/Hot Standby functionality provides 100% redundancy without any session loss. Sessions are replicated to the Hot Standby node in real-time. Switch-over is established using floating IP. Automatically provisioned through Routing Servers. Firewall is automatically configured through Routing Servers. In geo-redundant clusters, multiple Load Balancers work in Active/Active mode to distribute traffic between clusters. Health checks are monitored using Connect servers. Full SIP signalling and RTP with built-in firewall. All Signalling and Media servers work in Active/Active mode for redundancy. Supports unlimited scalability simply by adding extra servers. Multiple HPRAs can run side-by-side in active configuration. Linxa’s internal communication protocol allows Load Balancers to detect down Signalling and Media servers and only distribute traffic to active ones. If a Signalling and Media server goes down for any reason, only calls running on that particular server get disconnected. For maintenance, Signalling and Media servers can be turned off gracefully without losing any active calls. Firewall is automatically provisioned in real-time using media IP and port data in SIP messages. Heal Health checks are monitored using Connect servers. Unlimited CAPS due to scalable architecture.. Routing Servers are designed for 100% reliability. Multiple Routing Servers work in active mode side-by-side. Each routing server can tolerate downtime of Database or Connect and continue to operate indefinitely with the last loaded routing data. Have crash-guard mechanisms and built in security checks even against possible software bugs. Version conflicts between various Linxa software and data structures do NOT effect Routing Servers. Each routing server can be safely turned off without any service interruption. Capable of connecting to ENUM-complaint interfaces. External Lookup Carrier feature allows connecting to web services using JSON or XML interfaces. Number Portability is built-in without the need ENUM lookups or External Lookup.